These are the words that I’ve just heard as I finished teaching a baptism class. How exciting it is for me to be with young men, and even my granddaughter and niece and one of the children from the children’s home Dee and I support. This Sunday, On Resurrection Sunday we will be seeing seven follow the Lord Jesus through the waters of baptism in the new sanctuary. What a joy for me personally to be there for this service. As I reflect upon the commitments that I heard, this is the very reason we are engaged in the global discussion, and commitment of what it means to walk with the Lord Jesus Christ. Three young men are going to be joining Grace Bible College this next year. It is because of your participation, that the Lord has allowed us to see this fruit. 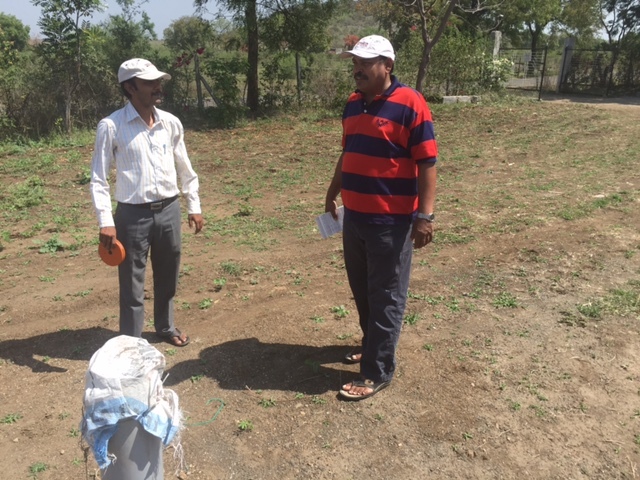 We are working out a plan for the rest of the year in activity and outreach to see the Lord give us a harvest….At this particular time in Central India, we are working our year plan for evangelism…. Pray for us as we work to share the Gospel message of Christ to the hearts of people. 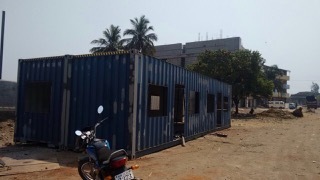 Two of our five shipping containers in the process of being modified this week in Mumbai. What you see is a direct result of your partnership to assist in facilitating the training of young people to serve the Lord. You have launched this project forward…. I am amazed once again at the power of many, and the power of one…. With each single decision each of you as our ministry partners make to participate in the project, the goal is brought one-step closer, and we are driven forward to the accomplishment of the finish line. When we join with others of like mind, our efforts are blended into the accomplishment of a mutual vision. Each of you that have given, has made an incredible, life-changing contribution, and an investment into the lives of committed young people that have pledged their lives to serve the Lord…. Shipping Container Dorms are Under Construction! Just a few short days ago, I boarded a plane in Colorado back to Delhi. My first meetings there were with businessmen to plan our final strategy for the shipping container dorms project layouts, timelines and delivery dates. Armed with computer drawings, as well as images on napkins, we launched the construction of the housing for the students of Grace Bible College. At 3:00 am the next day, once again I left for the airport for the 5:45 am flight to central India landing in Nagpur, and after a couple hours’ drive, arrived in Amravati by 11 am. It was good to be together with family and friends and refresh the relationships that we treasure both as IM staff and ministry. The following day I had the privilege of sharing the Word of God from Ephesians in the new Grace Bible Memorial chapel we dedicated just last month. The school year has ended and most all of the GBC students are in their summer practical ministry, so this is the full court press to make the dorm project take place…. The sacrificial giving that you have participated in has propelled us forward to take this step…. One of two GBC shipping container dorms. 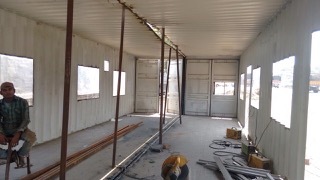 This is two 40′ x 8′ containers with a wall dividing at the 20′ point. It will house 10 bunkbeds, or, 20 men. I am pleased to share that the containers are currently going through their modifications to serve as dormitories. 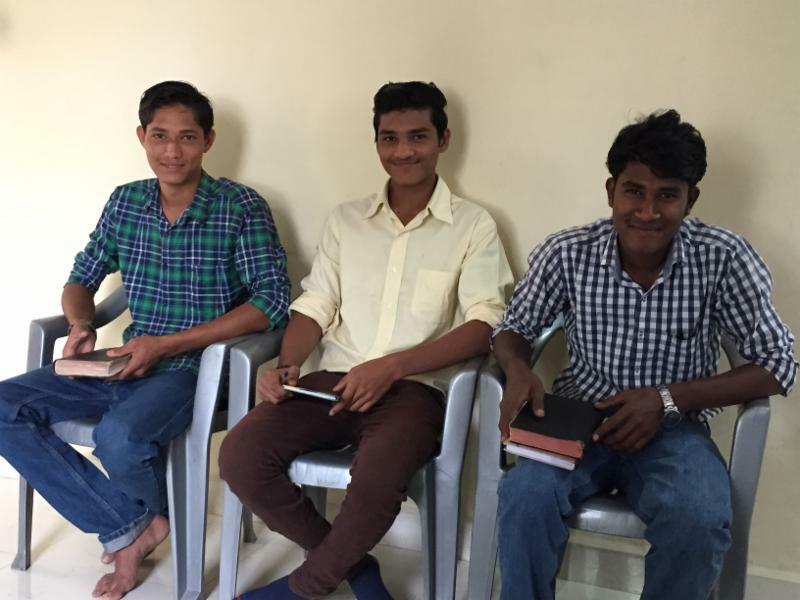 They are being prepared to house a total of 40 young men who will be preparing their lives as servants called of the Lord Jesus Christ to reach a nation and a region of the world for Christ…. Nationals Reaching Nationals…. 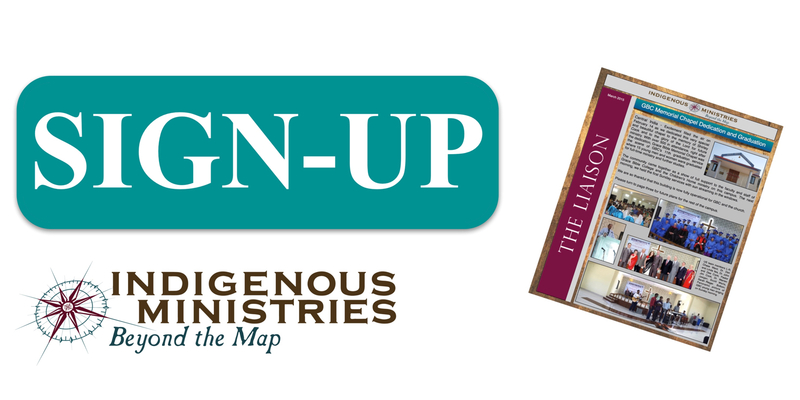 no longer theory or concept, but a reality that is transforming lives for Christ…. 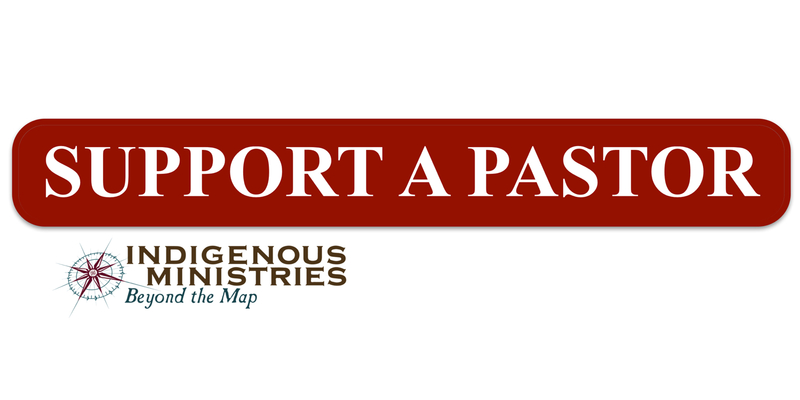 daily now through the efforts and influence of Indigenous Ministries. 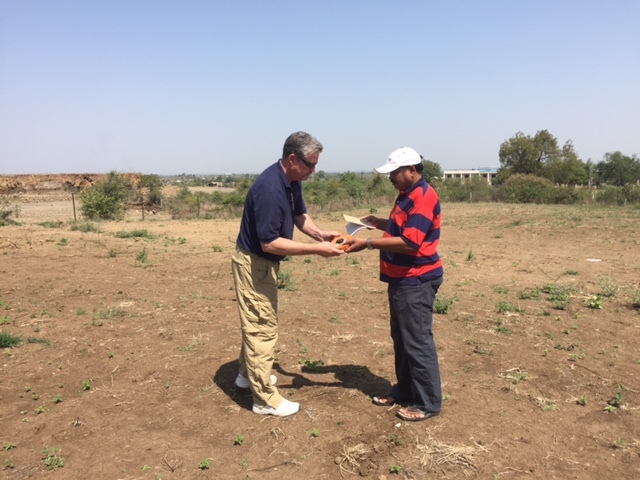 Yesterday the principal of Grace Bible College, Dr. Tantarpale, Mr Satywan, the academic dean of the school and I walked the property and future campus laying out the placements of the buildings. What a joy that we had in seeing a dream of over 12 years, taking shape. It is because of your heart and partnership to see people brought to a saving knowledge of Christ that this is taking place… Where else can you see such a direct transformational investment into lives that will make a difference in tens of thousands that they minister to? Thank you so much for sharing in this project. We are in need of approximately $55,000 more to finish this first phase…. Would you please pray this comes in so we can finish it soon? Thank you for your prayers and investment in the future of these young men and women studying at Grace Bible College. Stay tuned for more updates on the shipping container dormitory project. A few weeks ago my cousin and I in Portland went to a loading dock that held tens of thousands of shipping containers. 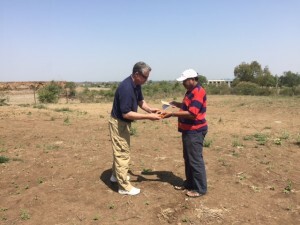 As I have shared with him the vision for our Bible college and central India, and looking to bring shipping containers onto the property to place them in connection with each other to build dormitories, classrooms, library, dining halls and other things that will be needed, his vision for what we are doing has grown exponentially. 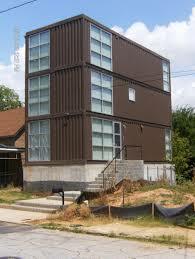 We went to speak with a company that manufactures houses out of shipping containers. Think with me, having a building that is earthquake proof, Typhoon proof, windproof, and just about any other proof that you could throw at this building. Giving us the ability to literally give 1/10 of what we were looking at financially to complete the Bible college facilities. 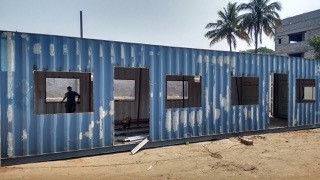 My heart just skipped a beat, as we walked into one of the shipping containers and I could see once again the direction that the Lord has for us in not only seeing the shipping containers put together and on our property in central India for our school, but the ultimate goal of training hundreds upon hundreds of young people to serve the Lord Jesus Christ with excellence and depth of education. There are many people that want to train fast and light, but I do not believe in this method because God expects us to be thoroughly approved workmen for him. As I looked at these shipping containers I can see the permanent structures that God would bring to our school. I was asking the Lord that at least $25,000 would come in by mid-February so that I could go ahead and order up the four dormitories for the property. But yet the Lord has seen fit to hold off on this amount at this time. So what I’m asking the Lord for is that by the end of May that we might see a total of $50,000 to have come in, so that we can facilitate the following year having our first year on our campus, and in our own facilities. What is so exciting is that these shipping container buildings are expandable, in other words we put two buildings up for four dormitories on our property but then we can put four more dormitories right on top of the existing dormitories, to make eight. Then we can put four more on top of those and as long as we have stairwells and access we have the ability to multiply these buildings so that we can ultimately have our vision and goal of seeing 300 young people being trained from our college campus to reach Asia for the Lord Jesus Christ. Would you pray with me that the Lord would bring this about in the days ahead as the Lord has challenged me to see these permanent buildings set in place, so that the full swing of the ministry can be propelled forward on our own campus. We had set an initial goal of $50,000, but to complete everything that is needed is a goal of 100,000. Would you pray with us that we would see this come in. Update on Grace Bible College graduation, Grace Bible Memorial Chapel, Women’s Conference, and more. 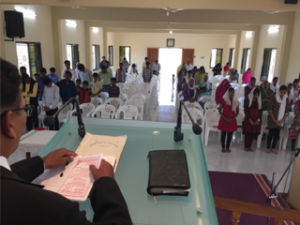 Central India – Excitement filled the air on February 14 as we dedicated this very special and beautiful chapel to the memory of Shirley Cook and to the glory of the Lord for future ministry. With over 500 in attendance, right after the dedication, Grace Bible Memorial Chapel was the scene of GBC’s 11th graduation service where 15 young men and women were graduated for full-time ministry and further studies. The community came together as a show of full support to the faculty and staff of Grace Bible College and the Children’s Home ministry on this campus. The next morning, we held the first Sunday services with sun streaming in the windows. We are so thankful that this building is now fully operational for GBC and the church. Some special young people live very active lives in our Children’s Home; over the nine years since we built it, the paint is worn; the walls and roof need repairs. 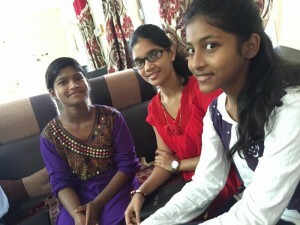 So, this June, we are asking young people 18+ interested in throwing their shoulders into fixing up our Children’s Home building to travel with us to India for two weeks for just that. They will also be helping with children’s Bible clubs in local villages for a very special ministry time. The Grace Bible College Chapel was Dedicated on 14 Feb 2015. Meet Matthew Mohod. He’s kind, handsome and soft-spoken. He’s also a recent graduate of Grace Bible College (last month). We’ve been Matthew’s sponsors at GBC throughout his education and big fans of his since he was a very little boy. 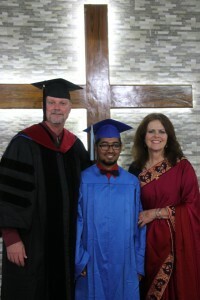 We chose to invest $100 per month into his Bible education for the past three years and last month he graduated and will go on for further studies. We’re proud of Matthew! He says GBC has prepared him to serve the Lord as a business man and he’s excited to reach people for the Lord in the business field. Pretty cool! On September 24, 2014 I was interviewed on KLOVE Radio. Read the story and listen to the audio recording. The day was blistering hot as we went with Pastor Abu-dani to the Jordan river, there to participate in the baptism of two Iraqi men of Islamic background. They had come to a saving knowledge of Christ and wanted to make a public profession through believers baptism! Pastor Abu Danni and Dr. John Cook baptized them by the historic site where John baptized Jesus. These two men are excited about their Christ, are sharing the gospel and ministering to their fellow Iraqis in Jordan. One is even praying about a future in ministry with us! 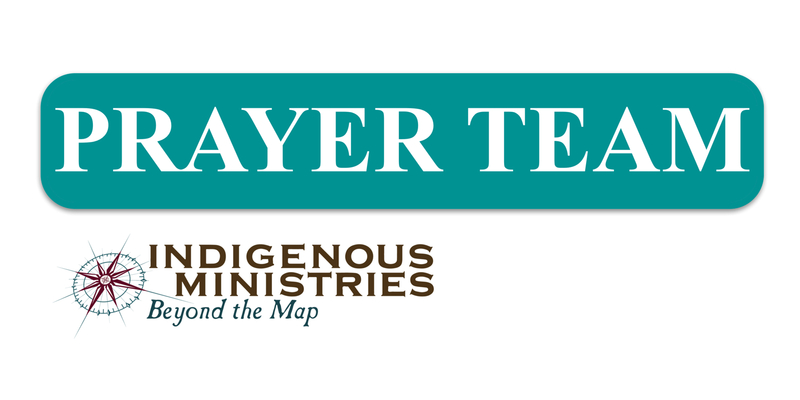 Pray with us for more believers, more opportunity for ministry, and more ability for ministry to the refugees in Jordan. We will continue to share updates with you as we get them. Thank you for the prayers for the refugees and those ministering to them, and the generous financial gifts you are entrusting us with. We are aware this is a special trust and are working hard to make sure the funds are targeted to help as many refugees as possible. Your prayers are so very important. Please continue to pray. Here’s a link for a business that sells custom T Shirts: PR127.com. They are donating half the price of each shirt purchased – with “We are …” next to the Indigenous Ministries logo in the middle of the page – to the Iraqi Relief Fund. Great idea! Thanks, PR127!